Match The Memory was conceived as a way to share the details of your life. A fun photo here, a memory of a vacation there. It was supposed to be public, yes, and shareable too, but not necessarily viral or discoverable. A customized memory game featuring your family photos is interesting to your Facebook friends or Instagram followers, but not the world in general, so why would there need to be a robust way for someone to search for your games? In practice, the site hasn’t been used in quite the way that I originally intended. Few people use Match The Memory to replace their annual family holiday letter, and many people instead create general-interest games that appeal to broad audiences. Teachers especially make games that help not only their own classes, but also any other students of their subject. That’s not a bad thing in the least, but it does expose some flaws in how I originally built the site. In the beginning, the Play page was the only place to find new games to play. It shows a few random games and gives you a search field where you can type, and a list shows the titles and addresses of public games that match your query. This works fairly well at filtering, as long as the game you want happens to have the word you’re looking for in its title or address. But it doesn’t allow you to see the games themselves, so you’re left with some questions: do they have pictures and text, or just words? Is the text too small for your target audience? Did the creator design the game in a way that’s pleasing to the eye? You have to click into those games one at a time to try them out. In time, I decided that games needed to be taggable, and searchable not only by the keywords in the title, but also by anything else that the game creator decided was relevant. For example, games about Motion and Forces should also be accessible by someone searching for physics and science. So I added the feature and the tags page was born. There, you can browse some of the most popular tags on the site, and click into see games tagged with those terms. The page where you view games for a specific tag has an advantage over the rudimentary search on the Play page: you can see the games’ preview images, as well as other tags that have been applied to each game. 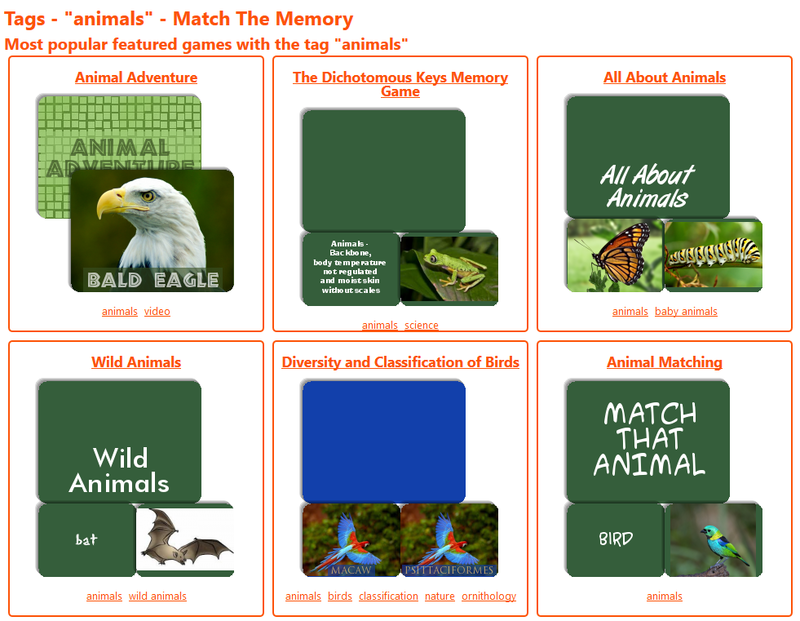 A matching game is a visual thing, and it’s easier to decide whether a particular game works for you based on a picture of that game, rather than just its title. But the tags page has problems of its own. First and foremost, it only shows the most popular (and as of last week, the most recent) games that are associated with each tag. 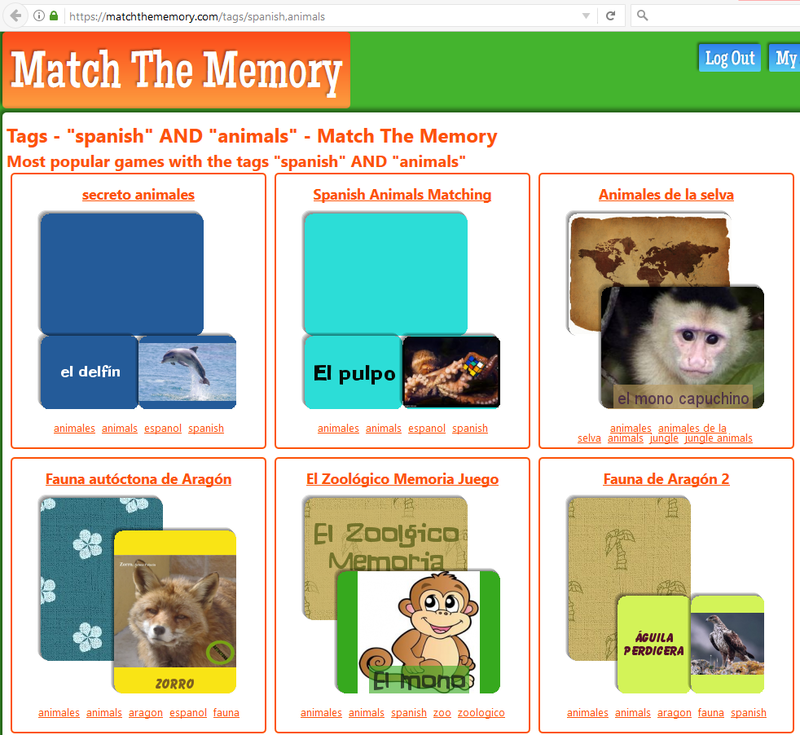 There may be 100 or 1,000 games on Match The Memory that have the keyword you’re interested in, like Spanish or French, but you can only see a few games in those very broad categories. 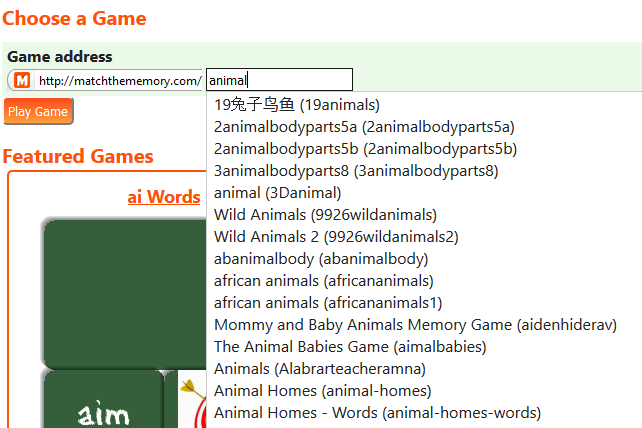 There was no way to drill down to easily find a game about animal names in Spanish, or colors in French, unless those games also happened to be tagged with animales or couleurs respectively. So last week, I built a feature to allow searching by multiple tags. 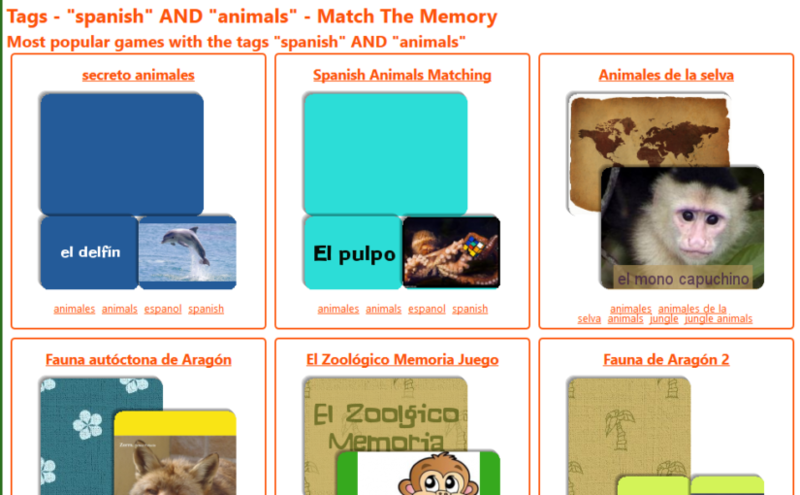 Now you can find games that are tagged with both “Spanish” and “animals”, or “French” and “colors”. Just add as many tags as you’re interested in to the tag search field, separated by commas, and you’ll be taken to a tag page showing games that match both tags. takes you to the same page as using the search field. This is not as good as a real game search engine that would take multiple search terms and show you the most relevant games based on all of those terms. That’s coming in a rebuild that we’re currently working on, so you can look forward to a better search experience coming soon (depending on your definition of the word “soon”). But in the mean time, it’s now quite a bit easier to find the perfect matching game for you.